Next week is the deadline for states to submit an application for the innovative assessment pilot to the U.S. Department of Education (ED). If you missed this news, don’t worry, you haven’t missed much. The Every Student Succeeds Act (ESSA) allows ED to grant assessment flexibility to up to seven states to do something different from giving traditional end-of-year standardized tests. The best example of an innovative state assessment system is New Hampshire, which allows some districts to give locally designed performance-based assessments. These assessments look more like in-class activities than traditional standardized tests, and are developed and scored by teachers. Two years ago, Education Week called the innovative assessment pilot “one of the most buzzed-about pieces” of ESSA because it could allow states to respond to testing pushback while still complying with the new federal law. But now only four states have announced they will apply, and expectations are subdued at best. When my colleagues at Bellwether convened an independent review of ESSA state plans with 45 education policy experts, they didn’t find much ambition or innovation in state plans — few states went beyond the requirements of the law, and some didn’t even do that. Even Secretary of Education Betsy DeVos, who has approved the majority of state plans, recently criticized states for plans that “only meet the bare minimum” and don’t take full advantage of the flexibility offered in the law. Several states responded that they were actually doing more than they had indicated in their plans. As my colleague Julie Squire pointed out last year, putting something extra in an ESSA plan could limit a state’s options and bring on more federal monitoring. 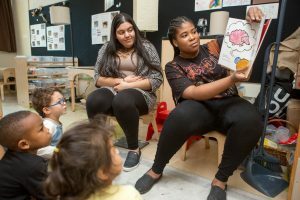 If most states were fairly conservative and compliance-based with their big ESSA plans, there’s little reason to think they’ll unveil something new and surprising in a small-scale waiver application. This entry was posted in Accountability, Education Innovation, Education Policy, Federal Education Policy, Uncategorized and tagged annual testing, assessment innovation, assessments, ESSA, Every Student Succeeds Act, federal policy, innovation, state education policy, test, testing on March 29, 2018 by Bonnie O'Keefe. How do states view the purpose of their state ESSA plans? This entry was posted in Education Policy, Federal Education Policy, Politics of Education, State Education Policy and tagged Diversity, ESSA, Every Student Succeeds Act, federal policy, federal role in education, politics, state education policy on December 21, 2017 by Juliet Squire. President Trump’s newly released budget would slash $9 billion — or 13.5 percent of funding — from the Department of Education. That’s a dramatic change. It’s important to remember, however, that Congress controls the country’s purse strings, so a President’s budget proposal serves more as a statement of priorities than a concrete action plan. For those of us who work on teacher quality issues, that’s a relief. For one, Trump’s proposed Education Department cuts include the complete elimination of the roughly $2.3 billion Title II program. States and districts use Title II’s Supporting Effective Instruction State Grants for teacher quality activities, like recruiting teachers and supporting effective instruction. Unsurprisingly, the mention of defunding Title II has teachers unions and advocacy organizations up in arms. Many state departments of education, districts, and schools have relied on this funding to support teacher-related activities for years. But the effectiveness of the Title II dollars spent is questionable. Although states and districts are given a wide array of choices on how to spend Title II dollars, they tend to stick to the same activities. 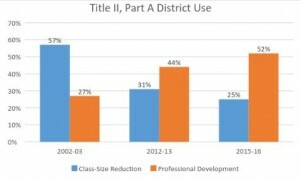 A closer look at the data on Title II use reveals that for more than a decade, districts have been using at least three quarters of Title II funding on just two activities: class-size reduction and professional development. Data via U.S. Department of Education; Chart via author. This entry was posted in Education Policy, Federal Education Policy, Teacher Effectiveness and tagged Class-size reduction, federal policy, Teacher Professional Development, Title II on March 23, 2017 by Kaitlin Pennington. Last week, the American Enterprise Institute hosted an event discussing the failings of civics education in America. The panelists referred to the dismal state of civics literacy as a “Sputnik moment” – a reference to when the Soviet Union successfully launched the world’s first satellite in 1957, stirring the United States to create the National Aeronautics and Space Administration (NASA) and dramatically increase its space exploration efforts. Nothing illustrates this comparison better than the election of Donald Trump. As Trump has demonstrated time and time again, he knows little about governing or policy – instead relying on divisive rhetoric and petulant Twitter tantrums. His most recent gaffe: at a White House convening of the nation’s governors, Trump said that “nobody knew health care could be so complicated.” As it turns out, many people knew. However, if Trump can name all three branches of government, that alone would put him ahead of nearly three quarters of Americans. According to a 2016 survey conducted by the Annenberg Public Policy Center, only 26 percent of respondents could name all three branches, and 31 percent could not name a single one. 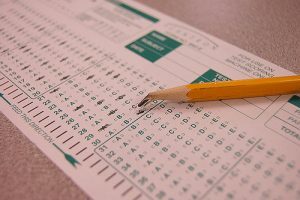 Data from the National Assessment of Educational Progress (NAEP) also show poor results. In 2014 – the most recent NAEP civics assessment – only 23 percent of eighth grade students scored at or above the proficient level. The same is true of older students getting ready to vote. In 2010, when NAEP last tested high school seniors, only 24 percent scored at or above the proficient level. Neither of these results has changed significantly since 1998. 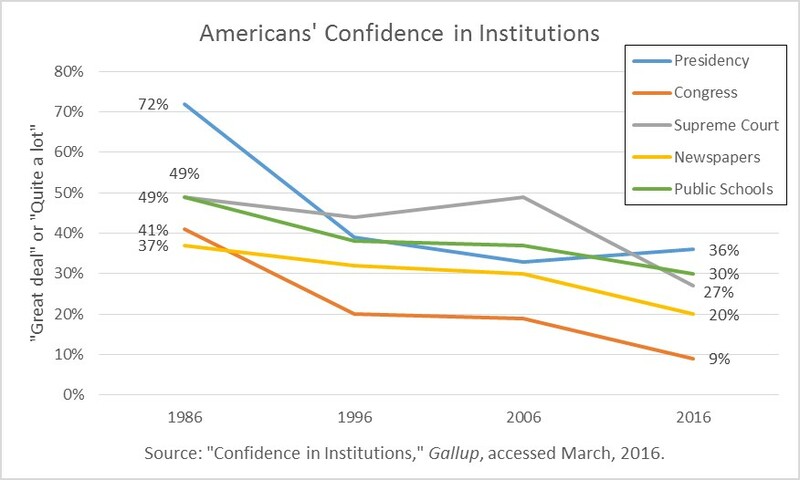 At the same time, faith in many of America’s institutions are at historic lows – even before Trump’s election. And it’s likely that his constant attacks on various institutions will only serve to worsen these numbers. 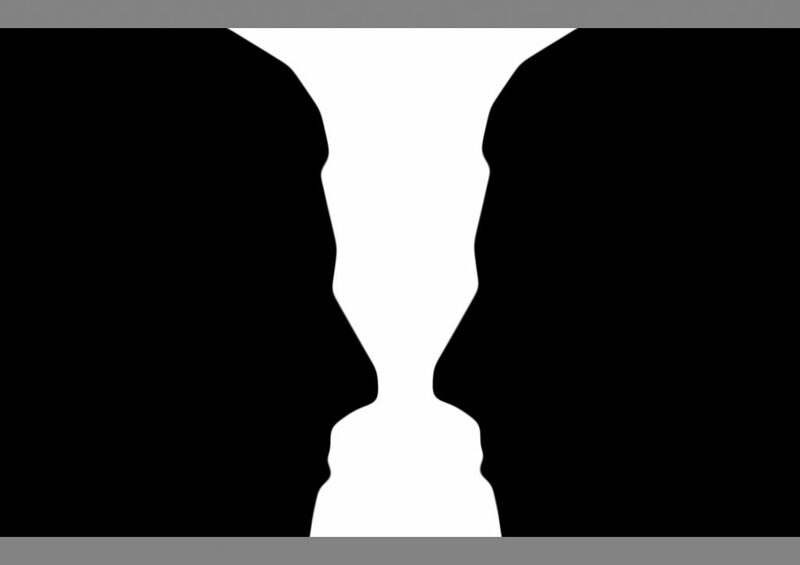 This crisis of confidence only feeds into the growing level of polarization, making it nearly impossible to govern effectively. It’s no wonder that recent congresses have been arguably some of the least productive ever. Despite these difficulties, the American people seem well aware of the problem at hand. According to the 2016 PDK poll of the public’s attitudes toward the public schools, 82 percent of Americans believe preparing students to be good citizens is very or extremely important. At the same time, only 33 percent think the public schools in their communities are doing that job very or extremely well. This entry was posted in Accountability, Education Policy, Federal Education Policy, Politics of Education, State Education Policy, Student Assessment and tagged Accountability, annenberg public policy center, annual testing, assessment, Civics, Congress, curriculum, Donald Trump, Education, education commission of the states, ESSA, federal policy, Funding, gallup, NAEP, pdk poll, politics, Russia, state education policy, Trump on March 3, 2017 by Phillip Burgoyne-Allen.